Meet Tom Wampler, board member of the Friends of the North Fork Library since 2008. Tom grew up on the San Juan Islands, the son of a commercial airline pilot father and flight attendant mother. He has traveled to many parts of the world, preferring any place off the beaten path that has the fewest tourists. Tom has always been a frequent library user and when asked if he would like to join the Friends of the Library board in 2008 he did not hesitate to get involved. Some of the many tasks he helps with are building and property maintenance, running book sales, participating in board meetings, and helping put on community and cultural events. He also generously volunteers to store the many boxes of books for our book sales at his home shop! The Maple Falls Community Garden is flourishing these days, thanks to Tom’s participation. He is one of the founding members and also helped put up the hoop house. He “enjoys taking a piece of raw land and making it beautiful and productive, just like the library,” he said. 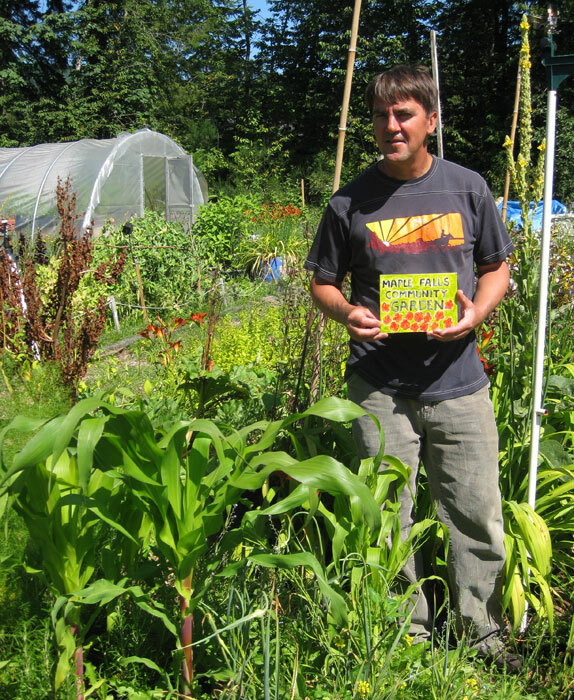 In addition to gardening, Tom loves art and has done ceramics, batik, and painting, including a week-long course at the Pilchuck Glass School in September 2012 where he painted the glass Maple Falls Community Garden sign he is holding in the photo. “I like being a public servant,” Tom said. Thanks, Tom, for all you do for the North Fork Library and in the community! This entry was posted in Volunteer of the Month and tagged North Fork Community Library, Volunteer of the Month, volunteers, Volunteers Needed. Bookmark the permalink. ← The Fossil Guy is Coming!